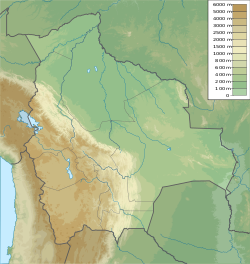 Acotango is the central and highest of a group of stratovolcanoes straddling the border of Bolivia and Chile. It is 6,052 metres (19,856 ft) high. The group is known as Kimsa Chata and consists of three mountains: Acotango, Umurata (5,730 metres (18,799 ft)) north of it and Capurata (5,990 metres (19,652 ft)) south of it. The group lies along a north-south alignment. The Acotango volcano is heavily eroded, but a lava flow on its northern flank is morphologically young, suggesting Acotango was active in the Holocene. Later research has suggested that lava flow may be of Pleistocene age. Glacial activity has exposed parts of the inner volcano, which is hydrothermally altered. Glacial moraines lie at an altitude of 4,200 metres (13,800 ft) but a present ice cap is only found past 6,000 metres (20,000 ft) of altitude. The volcano is a popular hiking route in the Sajama National Park and Lauca National Park. To climb the summit from the Chilean side is dangerous due to land mines, however it is relatively safe to climb the summit from the Bolivian side. The southern ascent starts over a glacier and passes an abandoned copper mine. It is believed that Pedro Rosende, a Chilean explorer, found the remains of firewood at the summit of Acotango. Because of this, it is thought that the mountain might have been one of the high Incan Andean sanctuaries. However, more exploration is needed to verify this information. ^ "Acotango". Global Volcanism Program. Smithsonian Institution. ^ Watts, Robert B.; Clavero Ribes, Jorge; Sparks, R. Stephen J. (30 September 2014). "Origen y emplazamiento del Domo Tinto, volcán Guallatiri, Norte de Chile". Andean Geology. SciELO. 41 (3). doi:10.5027/andgeoV41n3-a04. ISSN 0718-7106. Retrieved 26 April 2016. ^ Ochsenius, Claudio (1986). "La Glaciación Puna durante el Wisconsin, Desglaciación y Máximo Lacustre en la Transición Wisconsin-Holoceno y Refugios de Megafauna Postglaciales en la Puna y Desierto de Atacama" (PDF). Revista de Geografía Norte Grande (in Spanish). 13: 36. Archived from the original (PDF) on 2016-03-04. Retrieved 10 April 2016. This Oruro Department location article is a stub. You can help Wikipedia by expanding it. This page was last edited on 1 October 2018, at 15:40 (UTC).